The Hugo Boss 'Sophisticated' range features sleek, slim pens in chrome or timeless black and chrome. The 'Sophisticated Diamond' ballpoint pen has a chrome cap with an attractive and intricately engraved diamond pattern. The cap twists to extend and retract the ballpoint. Accepts standard G2 refills and comes complete with a blue refill. Presented in a matte black Hugo Boss box. I have to say that the communication with this company is first class, not to mention the beautiful quality of the pen and the engraving on it, superb!!!. Ordered my item well after 2pm and I received it the next day!!! Much praise is given to the company and its employees. The Hugo Boss logo runs around the ring at the centre of the pen - between the lower, black barrel and silver cap part. 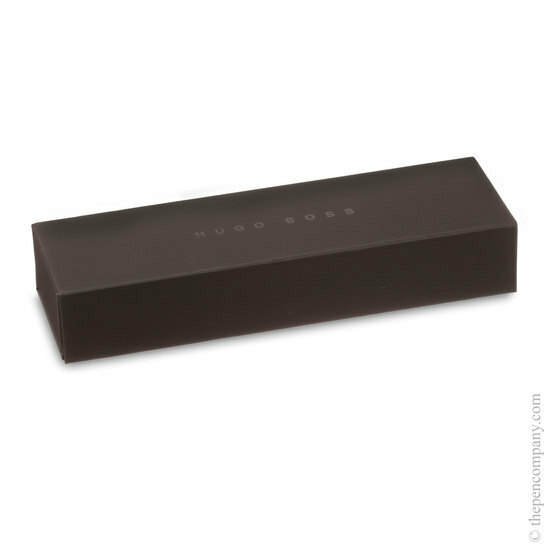 The pen is also supplied in a smart gift box with the Hugo Boss logo/branding. Generally, for most engravings, the nicest place to engrave this pen is on the clip - this is subtle but effective, without detracting from the overall look of the pen. If your engraving is short - a few initials, or a very short name, you may consider engraving these on the "cap end", this is the very end of the pen and suits short engravings well. If you require a particularly long engraving then this will need to be carried out on the barrel - the text would appear sliver against the black finish.